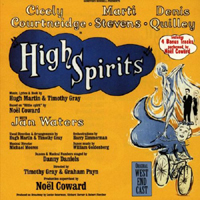 Original London Cast, 1964 (Pye/DRG) (3 / 5) Coward tried again, this time without Lillie, and what was a nervous hit in New York was a flat-out flop in London. The cast album isn’t bad, but it lacks the exciting personalities of the New York original. 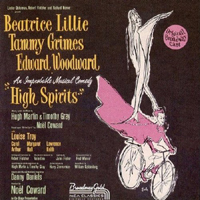 Tammy Grimes, with her smoky voice and singular delivery, is much missed. Her replacement, Marti Stevens, does not for a moment suggest the eccentric, ectoplasmic Elvira. Cicely Courtneidge is fun as Madame Arcati, and Dennis Quilley is a really first-rate Charles, but Jan Waters as Ruth lacks Louise Troy’s apt, world-weary manner. Still, the recording is worthwhile for several reasons: “Home Sweet Heaven” has some new, even more riotous lyrics (“The King of Prussia / I call him Freddy / Is living by mistake / With Mary Baker Eddy”), and a set of bonus tracks features Coward himself singing “Something Tells Me,” the ballads “If I Gave You” and “Forever and a Day,” and what may be the definitive version of “Home Sweet Heaven.” — D.B.